The Recess committee is asking for parent volunteers for assistance in providing students with some structured activities outside during recess and lunch. Significant positive impact can be made immediately by focusing our current limited resources on wide games – game which can be played outside (primary students on the field beside the playground and intermediate students on the soccer field), can be started quickly, and require minimum resources, ie soccer ball, traffic cones. One or two volunteers wearing orange vests can facilitate these activities. (These volunteers will also give the perception of more supervision.) An announcement will be made to students before recess and lunch to let them know which grades are invited to participate in an organized activity that day. Clubs that require special expertise, tools, rooms, equipment, etc. should be a focus after we have made progress on these “wide” games. A schedule has been drafted so that parents can sign up and see which time slots need volunteers. Please contact Yvonne Parkinson, our volunteer coordinator, for more information on this, at yparkinson@shaw.ca, or Tracey Sullivan at stblsullivan@shaw.ca. Steve Fleck has offered to facilitate a Volunteer Meeting for anyone remotely interested in volunteering on Monday, November 15th at 9am in the staff room. He will be available to answer questions and provide a hand out with information such as how to deal with conflict on the playground, as well as some common playground games. My name is Tami Rowe and I have a grade 2 student and a kindergartener here this year. I am speaking tonight as a representative for the Ecole Heather Park PAC safety committee. Please contact Sally Connon with any additions to the agenda. There are no guarantees that all issues will be dealt with, as we have limited time, but will do our best. • Executive met on October 13, 2010 to address action items from the October 6, 2010 meeting; met again on November 3 to set the agenda for this meeting. Will meet immediately following today’s meeting to action all items from today’s meeting. • Teacher request to establish a prize box to award “super stars” – How much? $50? x) Next meeting December 8, 2010 at 7:00 pm. The school recently held a mascot competition, with assistance from the PAC. 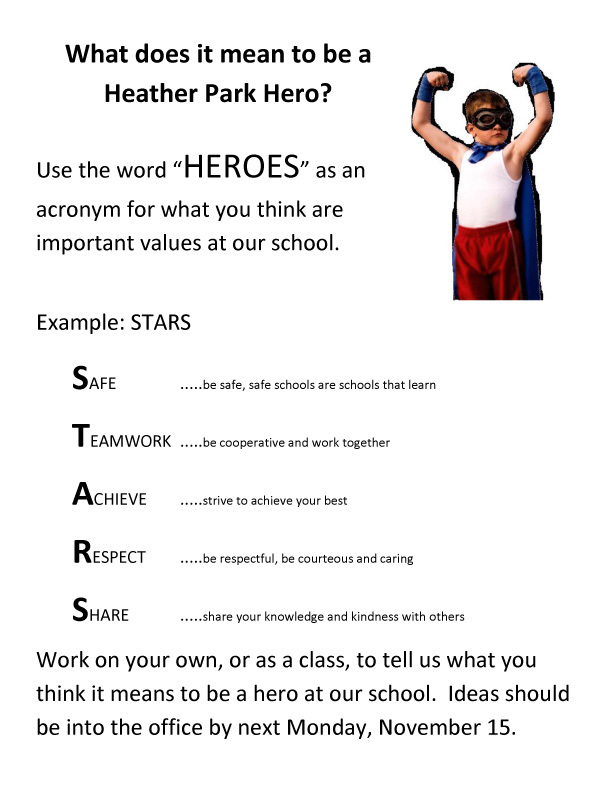 The winner was picked on Friday, and the school mascot is now the “Heather Park Heroes”. Guidelines for resolving problems – our school district’s guidelines for problems resolution.This one pager gives direction on where to go if you don’t receive satisfaction with regards to your issue. The recommended order is the teacher or staff member with whom the issue may be, then the principal or vice-principal (Steve Fleck or Dan Watt), then the assistant superintendent (John McLay), superintendent (Brian Pepper), the board of trustees, and then the student appeals branch. Something is bothering you about your child’s education and you can’t quite put your finger on it. Or you know what is bothering you, but you don’t know what to do. You are not alone. Many parents worry about how, when, or even if, they should act. Sometimes parents don’t have the time or confidence to deal with their concerns. Others fear that raising a concern will make the situation worse for their children. Often parents are unsure about where they “fit” in the public school system when it comes to speaking up for their children. Some don’t feel welcome, for example, when they have concerns about bullying, their children’s progress or how their children are treated by staff. Our children and youth spend much of their lives in school. Naturally, parents feel the need and the responsibility to make sure their children are treated well and receive a good education. As a parent, you love your children – you know them best and you are committed to their well-being for the long term. You are responsible for ensuring your children’s best interests are first and foremost. The people who work in the public school system are responsible for hearing your concern and working with you to solve the problem. • An outline of parents’ and students’ rights and responsibilities. • A guide to working through a problem. • An approach for dealing with parents’ fears. • Tools to help parents stay on track. • Information about the public school system. • Places to look for more help. Please let us know if there is any more information that we could provide. We will be holding our first hot lunch (Panago) on Nov 12th for intermediate students only, the primary will be held on Nov 26th. Order forms should be going home today for intermediates & deadline for returning forms will be next Wed, Nov 10th. No late orders will be accepted. The plan is to run the concession Mon – Thurs each week, and the group is working to start up in a week or two. The plan is for different days of the week for primary and for intermediate students. The menu will be announced later. There will be a contact sheet of group members available at the PAC meeting on the 10th for anyone interested in helping out. We are still in need of parent volunteers for Nov 12th to help distribute the lunches in classrooms.